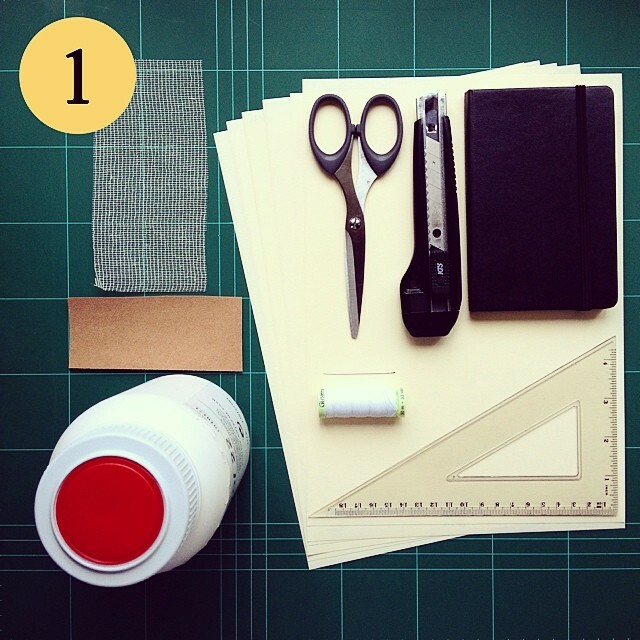 You don’t need to be a professional in bookbinding to make a great quality notebook. Maybe the first test doesn’t reach a perfect result but you will be surprised how easy the improvement goes and how fast the mistakes are solved. After two or three notebooks done there is not room for bad quality. Excellence is the goal, not perfection. Perfection is impossible and it’s not welcome in a handmade artwork. 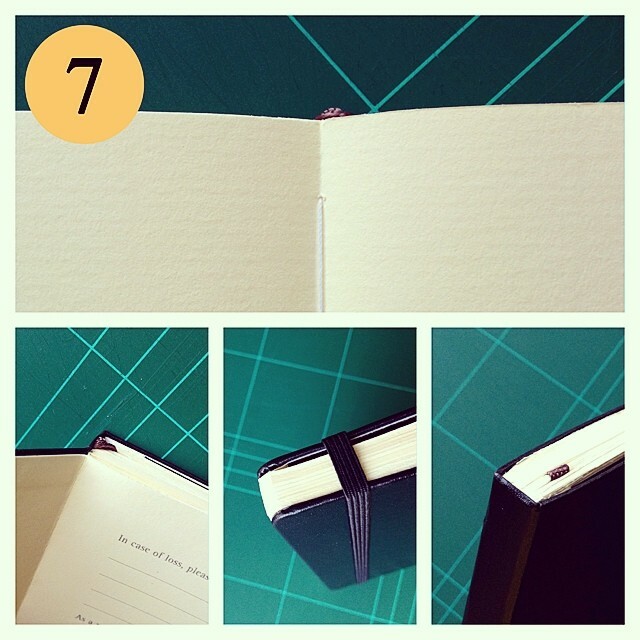 The notebook made by yourself offers a higher level of satisfaction than any other. You add the passion and love for it, your favorite paper and details. You add a part of yourself in it. Unfortunately it’s not possible get that from the shops, where an industrial notebook is done by a bored worker, probably Chinese or robot, who is paid per hours and produces hundreds of them every day. Your dear and loved notebook is just one more. On top of that the quality standards in the notebooks paper used to be poor nowadays. Endless variety of brands and styles, more than ever, with poor quality. And expensive. 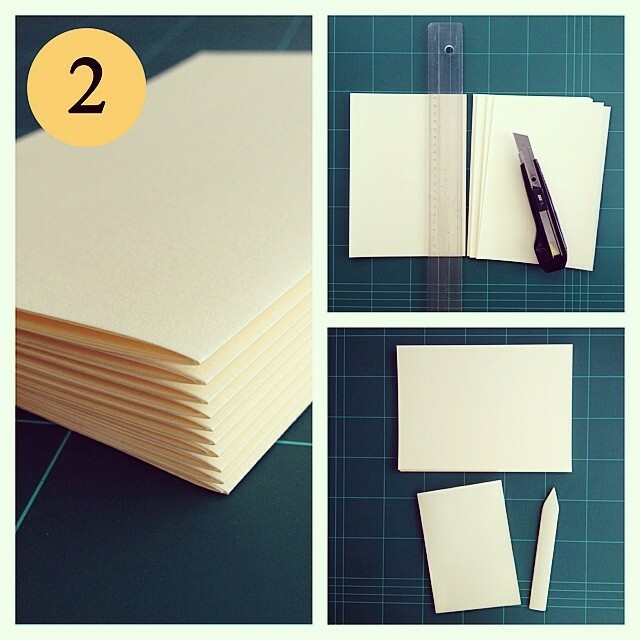 Only about 15 sheets of paper are needed to fill a pocket notebook, which is less than 1 EUR even for high quality paper. 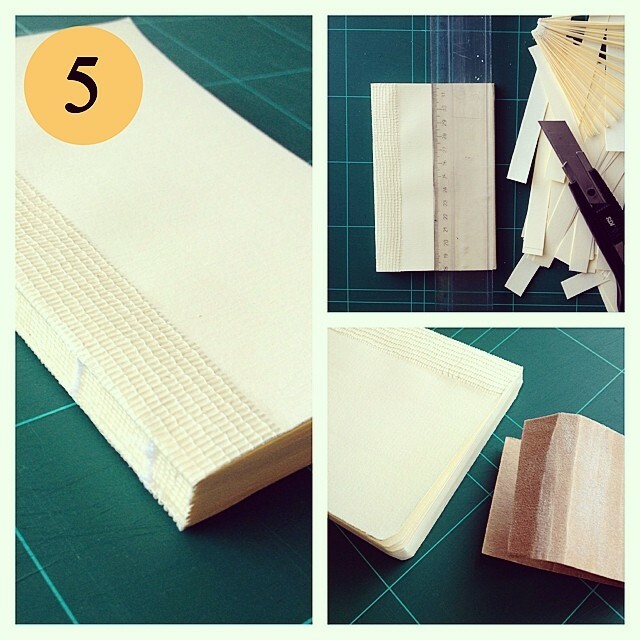 Bookbinding is an old technique and there are many methods. I’m showing here how to fill a Moleskine notebook with your favorite paper, that’s what I use in my last notebooks and was a clear milestone in my journals evolution. You can also make the cover in real leather, which is even easier. I will show that in a separated post. 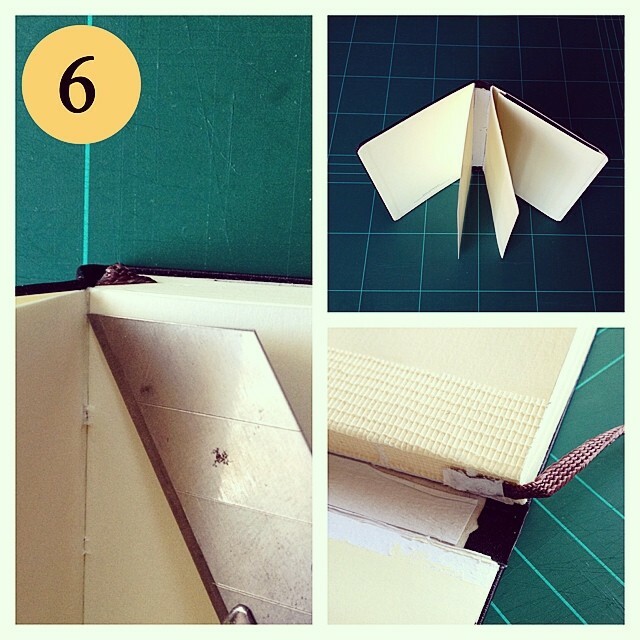 Bookbinding is a relaxing task. Bookbinding is perfect for meditation. 2.) Folding the sheets. Cut the A4 sheets in A5 size. Only 15 sheets A4 from 100g/m2 paper are enough for a Moleskine pocket. 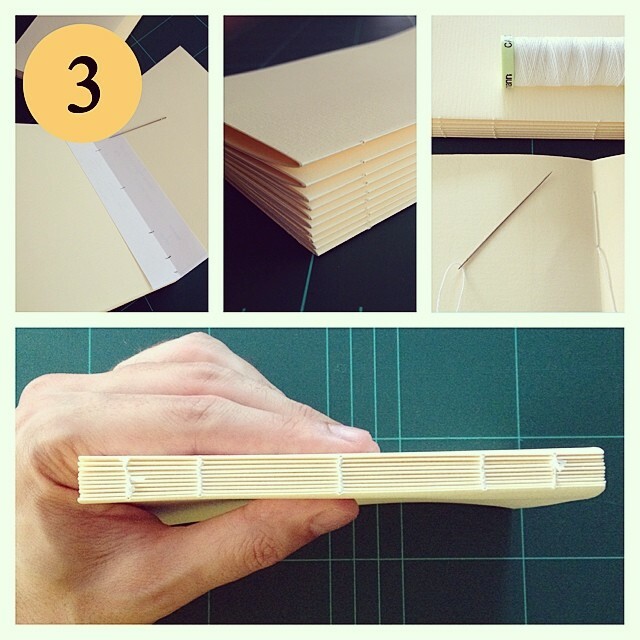 Fold them and make groups of 3 sheets each. Press them properly. 3.) Binding. Perform 5 holes with a needle and a template. Sew applying the method you like. The easy method I apply will be explained in a next post. 4.) Paste the stack. 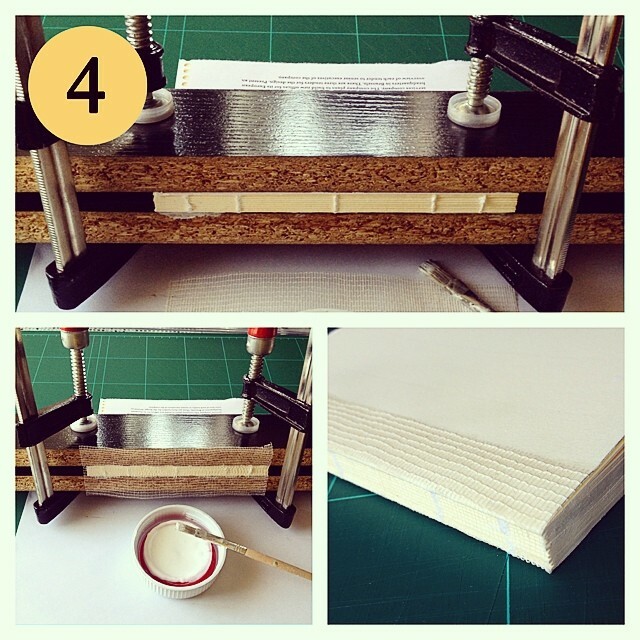 Press the sheets in order to apply glue only on the edges. Set the cotton fabric and apply more glue. Release the stack and paste the wings of the fabrics to the paper. This will avoid tiny clearances between the sewn sheets. Keep the stack under weight for a time while become dry to keep the paper full flat. 5.) Cutting the paper. Cut the edge of the stack to fix into Moleskine dimensions. Use the sandpaper to shape the corners. 6.) Remove the paper. Kill the Moleskine. Do not suffer or produce too much tears. Cut the paper from the second pasted pages (front and rear part of the notebook). Reuse the register tape and glue it in the new paper. 7.) Insert the new paper. Paste the stack made with the new paper into the cover. Apply glue only on a small area of the external sheets, not in the edge. Voilá! New notebook is ready for all kind of inks. 8.) Extra. When the notebook is complete is good idea to add a few more details like a stylish paper in the first pages or an acid-free tissue paper pocket for better conservation when being stored. 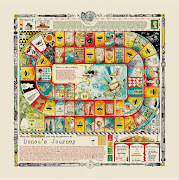 Wonderful idea and love the step by step photos - thank you! Hola José! Cuando dices que solo se necesitan 15 hojas de papel bueno, con bueno ¿a qué tipo de papel te refieres? He visto que el que tu usas es igual que el papel verjurado en color crema de 120 g/m2 de la marca Liderpapel que yo tengo en casa, ¿este me serviría? ¿o es mejor el de la marca Galgo u otra marca? Y otra pregunta (lo siento, se que soy muy pesada) ¿Que haces con las páginas que quitas de los moleskines? Muchas gracias, me ha encantado esta idea! Hola, Oveja Negra ;) Gracias por tu comentario. El papel es algo muy personal. A mí me encanta Galgo verjurado de 100g/m2 color crema, pero es cuestión de gustos y, sobre todo, de probar. Con las páginas que quito de las Moleskines no hago nada. ¿Quieres algunas? Quedan bien poniéndoles unas tapas de cartulina forrada con mapas, por ejemplo. Muchas gracias por tu respuesta!Lo de las páginas de las Moleskines era por saber que hacer con ellas luego, por darme alguna idea para darles un segundo uso y lo de las tapas de mapas me ha gustado mucho así que me lo apunto como idea! I use A4 paper and I cut it to A5. Then I fold A5 in half and I bind the signatures. That's more than 9 x 14 cm and I cut the block with that measures. I hope it helps to answer your question! Thank you! It works perfectly! I don't know why I was having so much trouble visualizing that. I finally measured and cut a piece and it's exactly as you said! Thanks for the immediate reply. 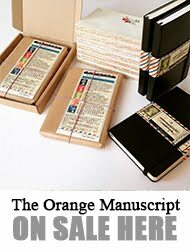 I can get my Moleskine and try it! Great guide, Jose. Will definitely try this. One question... what kind of sandpaper works on the notebook corners? Very fine? Or is there a sandpaper specifically made for sanding paper? 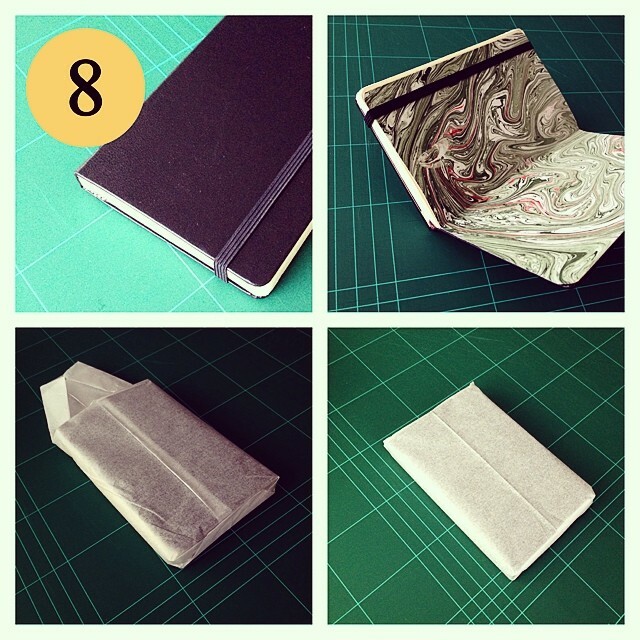 This is so interesting, but where do you get moleskin covers? I made my own inserts. First time visit your page... mmm where do I find moleskin cover? I’m try to make one with watercolor papers. Great blog post and really helpful.Thanks for sharing. está de maravilla este tutorial. Pero a mí me queda la duda de qué gramaje es el mejor para trabjar con acuarelas. He leído que tu utilizas papel 120 g pero, ¿hace mucha diferencia si tiene algodón o no? Thanks for the demo. I especially like the tip about the preservation sheet. Barnes & Noble still sells Moleskines. Hola Sr. Jose Naranjo, francamente no he comprendido los puntos de 6 en adelante del proceso de encuadernacio, eso de matar los Moleskines y no producir lagrina excesiva, me ha dejado fuera de juego. Lo de cortar las segundas hojas no lo veo claro y donde se inserta la cinta, no la de señalizar, sino la que envuelve al caudernillo, tampoco se ve donde se produce. Le agradeceria aclarara mas esos puntos. Donde se puede adquirir la Tela Moleskine, en tiendas de tejidos o en tiendas especializadas en papel y material de encuadernacion, papelerias especializadas ? Ni que decir tiene que me he quedado prendado de su ENORME trabajo, que supone un gran aliciente para estimular gente creativa. I loved the creativity behind this blog kudos! But I wish, you had something to make like these notebooks! Which are terrific!